This has to be the craziest most unusual roller-coaster ride nine holes I've ever had in my life. It started out pretty bad, looked good for awhile, and then at the end it blew up completely in my face. Getting a double-bogie on the first hole was a bummer, especially when it was followed by a bogie, meaning that I was already three over par after only two holes. A par on the third hole was more like it, and at that point I felt like things had settled down. If I got lucky I could shave off a couple of those strokes with a birdie or two later on. Then the magic came. Birdie, birdie and then an eagle (finally, it was my first eagle at my home course since I joined three years ago). Four under in just three holes, equalizing that lousy start and putting me one under. Feeling pretty darn good, indestructible now. On the 241 meter par four sixth hole, I hit the green from the tee using my three wood and this is where the ball landed. I took this picture just before I sank the ten foot putt for an eagle. A par four on the seventh, so far so good. At that point I was feeling pretty strong, like I could still pull off a birdie or two before I made the turn. The drive on number eight faded ever so slightly, cleared the bunker on the right, but ended under a tree on the other side. I meant to play it safe by just punching a seven iron into the fairway, but I hit it a tad too purely, ending up right on the edge of the lateral hazard, balanced on a pillow of grass hanging over the water with nowhere for me to stand. I balanced precariously on my tip toes, but then I whiffed the ball, yes you heard me right, I missed the ball completely (hadn't done that in many years). Then I managed to connect to the ball, but pulled it way left into the woods and high brush, no way I'd ever find that ball again. Dropped and made a nervous swing, punching my seven iron to the front of the green. 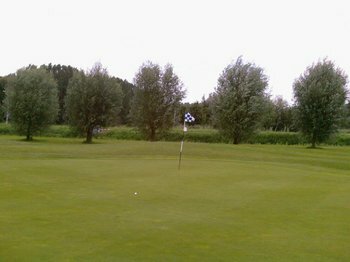 Finally, I three putted from there for a very painful nine, which is a quintuple bogie. From one under par to four over in the span of one lousy hole. I should have used my brain and taken a drop from the hazard and accepted a double-bogie. If the ball had only rolled half a millimeter further, it would have fallen into the water and I would have had to drop anyway. But you know how it goes when you're hot, you get cocky and think that you have supernatural powers. I'm a jerk and I know it. A par on the ninth would have been nice, but I was pretty shaken up after the previous hole, hit my drive real fat, had to be satisfied with chip and two putt for a bogie. To recap the roller coaster golfing adventure fiasco: double-bogie, bogie, par, birdie, birdie, eagle, par, quintuple-bogie, bogie. Which all adds up to a ho hum forty-one.